Making candles at home is easy and a beautiful art. It can be a great hobby for your children during their summer holidays and in their free time. 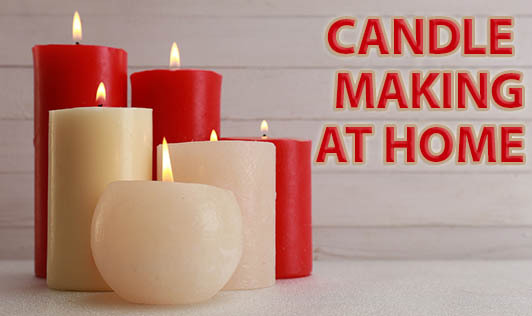 Here is the procedure to make candles at home. 2. Wax crayons (any colour of your choice). 3. Vanilla essence for fragrance. 5. One small bottomed long vessel. 1. Fill half of the large bottomed vessel with water. 2. Cut wax into small pieces and put it to the small bottomed vessel. 3. Grate or break the crayons into small pieces and keep it aside. 4. Heat water in the large bottomed vessel and place the small vessel in the large one. 5. Heat till the wax in the small vessel melts. 6. Add vanilla essence and crayons to the melted wax. 7. Wait till it cools down to room temperature. 8. Place the thread in the glass tumbler. Let the tip of the thread come out of the tumbler. 9. Pour the melted wax into the glass and adjust the thread to stay in the center. 10. Wait till it solidifies. 11. And your home made candle is ready! Make these candles during a house party by using different colour, different essence and different shapes. You can also use it for an exotic candle light dinner. Teach your children to make this during their spare time. This would help them to improve their knowledge about colours and a good deviation from computer and television.